Google has added some new features to mobile search, making searching the weather and calculations a more interactive experience. Now when you search for the weather, you'll see 10-day and hourly forecasts, while hunting down the solution to a calculation will pull up a fully functional scientific calculator. Flight status is also going to be quick and easy to find, while finance, conversions, definitions, time look-ups are also going to provide you with more info and more options from the search results. You'll start to see the new features hit Google.com when accessed from a mobile or tablet browser from today, while they'll also be coming to the desktop soon too. 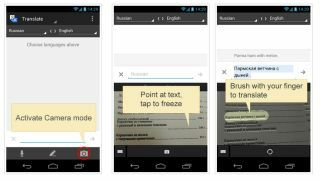 Google Translate has also had a Word Lens style update to allow it to translate words using the camera of your phone to input text which you can then highlight using your finger. "This makes Google Translate for Android one of our most intelligent and machine learning-intensive apps," Google reckons in its blog post on the matter. "Speech recognition, handwriting recognition, OCR, and machine translation all rely on powerful statistical models built on billions of samples of data." All so you can find out what Königsberger Klopse really is.